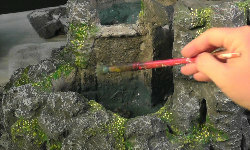 to make this waterfall for the beginner. The steps I took are very similar to all of the other waterfall construction projects on this site. other critters (such as a bearded dragon) could suffer because of it. proceeding to the waterfall construction. For a couple of years now I've been using some hotwires from the Hot wire foam factory to do a lot of the cutting of the foam. I still use a knife in tandem with the hotwires as there are benefits to using both. I use foam because it's easy to build up mass or size using foam without the unwanted weight that I would add to the structure if I used wood or some other material. 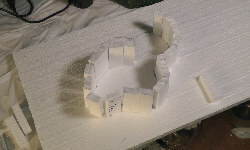 After the foam design was completed I proceeded to cover the project in Foam coat -again from the Hot wire foam factory. This substance is very similar to non-sanded grout, but is specifically designed to be applied to eps polystyrene. I applied one layer, but if you are making this for a pet, I would apply more layers to strengthen the piece. 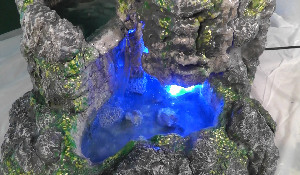 Once the basic structure was covered with foam coat I did a test to see if there were any problems with the waterfall. I do this because if there are, I can fix the issue(s) before I apply the paint job. This can save you a lot of time and frustration. So, for that test I applied a water resistant sealant to all of the areas that would have water on them all the time. I determined that there were no structural problems -so I proceeded to the paint job. Be sure and watch the video above on how to build a waterfall for the beginner, as it goes into much more detail. rock just to add some detail.After the painting stage I sealed it with a non-toxic sealer that is water resistant. You'll want to put at least four layers on if you're making this for a living creature. pieces I made that fit together (so that they wouldn't stick together) because of the tacky surface most sealants leave behind. So, take these waterfall construction ideas and build yourself an indoor waterfall that even the beginner can do!